Creamy, Fruity, Naturally sweet, Nutrient- rich, Healthy, Satisfying & Quick to Make! Words that describe this delicious smoothie bowl. This bowl makes the perfect breakfast or snack – when you’re in a rush but need something substantial. Simply add a frozen banana and frozen mixed berries to a blender and blend on low. Blending on low is very important! This keeps the smoothie from liquifying too much – keeping a thicker texture. If you love ice cream, you’ll love the soft serve texture of the smoothie bowl! 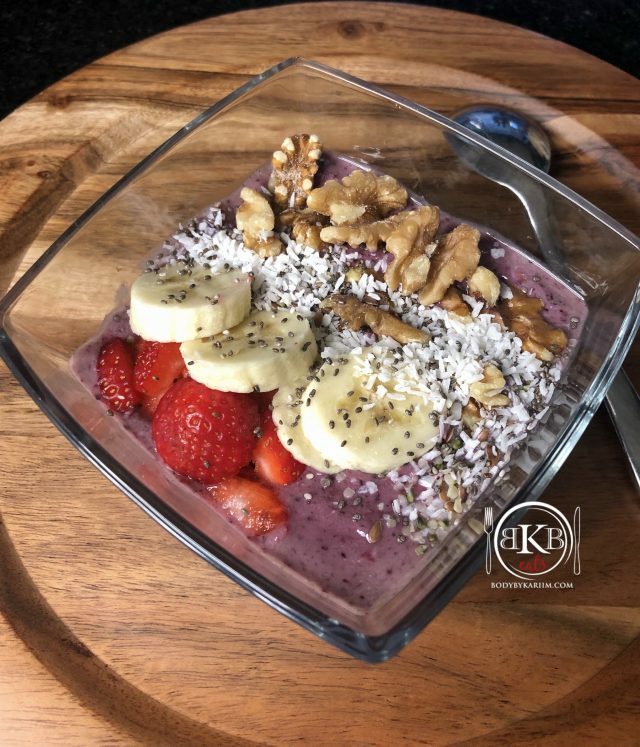 Adding toppings like coconut flakes, chia seeds, flax seeds, or hemp seeds – for added nutrients, fiber, & protein is another delicious part of the smoothie bowl recipe. Though fruit toppings are a pretty addition to the bowl, it’s completely optional since the entire bowl is made of fruit. Ingredients: Note: Feel free to add more or less per serving if needed. What I used was enough for 2 full servings for Kariim & I and a small serving for Elle. Add frozen berries, banana, and milk- to high speed blender and blend on low until small bits remain. Add protein powder (optional) and blend again on low until a little smoother. Scoop into 1-2 serving bowls and top with your choice of toppings. Best served fresh. Though leftovers can be kept in freezer for 1-2 weeks. Let thaw before enjoying.